1. Constable George Doyle, Albert Dahlke and Sam Johnson left early for the 10km ride to Lethbridge’s Pocket. Johnson, packhorse in tow, led the way, tracking along the bridle path into the Pocket. 2. At 7am, they crossed Main Range and began gradual descent. 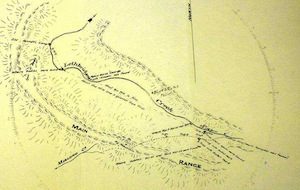 Before the group reached the ground, Johnson realised that there were tracks that veered to the right and in the opposite direction to Old Kenniff’s camp. Pat, Tom and Jimmy Kenniff came riding from the gully towards them, 160m away. 4. The Kenniffs stop instinctively as they saw the party. Sam rid himself of the packhorse. Doyle and Dahlke charged towards Kenniffs. 5. The brothers discarded their two packhorses and split in two directions. Jimmy: east, up out of the gully and across level ground towards Lethbridge’s creek. Pat + Tom: south up an incline on the Western side of a stony hill. Doyle and Dahlke pursued Jimmy. Sam pursued others. 6. In 300m Dahlke overhauled Jimmy, brought his horse to a stop by grabbing its reins. Doyle dismounted went to the near side as if to pull Jimmy off his horse. Then Johnson arrived. 8. Johnson told Sam to go to the packhorse to retrieve the handcuffs. Sam remounted and headed back towards the packhorse. 9. Doyle’s revolver was 10m or more away in his holster on his horse. 10. Sam was just dismounting at the packhorse when he heard a loud sound of a shot being fired. He looked towards Doyle and Dahlke, but could not see anything for the trees. Sam states that 20 seconds after the first shot, another was fired. 50 seconds later 3 more shots fired, in quick succession. Sam reports the shots were not from Dolye’s gun as they were too loud for that of a police revolver. 11. Sam remounted his horse and led the packhorse back towards the crime scene. He then claims to see the Kenniffs riding towards him, abandons the packhorse and rides for his life, away from the scene.